regain stability, develop a connection with their children and find joy again. let go of the past so they can enjoy "the now"
Ciji helps women, at all stages of life, find peace in their present and find hope for their future. For new mothers experiencing postpartum depression or anxiety, she helps you regain confidence in yourself, your ability to connect and care for your little ones and reinvigorate a life of joy. For women who are experiencing chaos in their relationship she helps you evaluate where you are in your relationship, communicate your desires for the future and make effective changes towards those goals. For women at a defining crossroad in life, where your direction seems confusing, she helps your halt the anxiety of making the wrong choice, and help you understand as well as believe that you can do it! She does this through Cognitive Behavior Therapy and Guided Therapeutic Imagery. In a simple terms, she helps change the way you think about yourself, your circumstances and your future. ​In addition to providing counseling to alleviate symptoms of depression, anxiety, and stress from life transitions, she has received additional post graduate training in the care of new mom's experiencing postpartum depression or anxiety. She also provides Christian counseling and can incorporate interventions that are faith based. 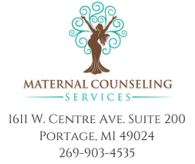 We specialize in the care of moms facing postpartum depression or anxiety. Receive face to face counseling or counseling via video, so you don't have to leave your little one or bring them out the home. We provide face to face counseling for women at all stages of transition. We can help you unravel the questions and answers that keep you from going forward in life. We provide face to face counseling for couples focused on strengthening, empowering, or restoring their relationship. Paperwork to be completed and brought to your first appointment.